Can you feel it? Is the air getting a little crisper? Because things sure are shifting over here. It’s happening a little sooner than I’d like if I’m being honest, but Fall is in the air, and that means we have some Fall home decor happening in the house! I keep it pretty simple, especially with very curious littles around, but there are definitely a few changes being made over here! 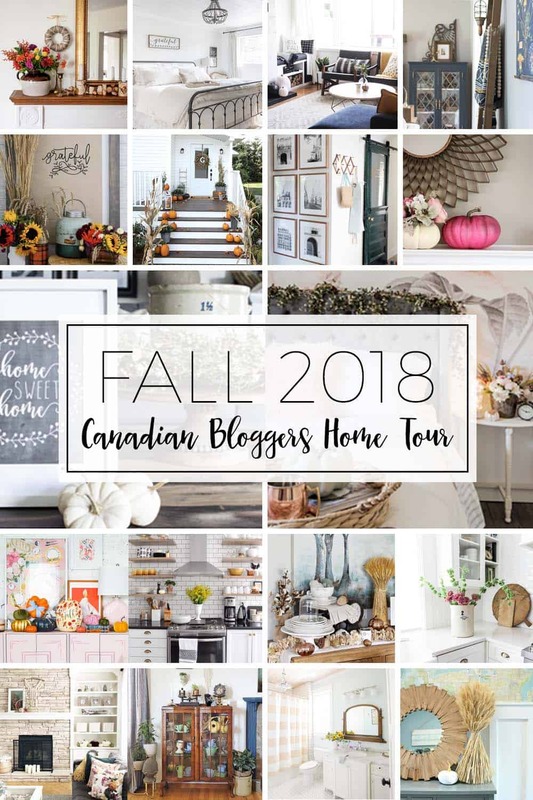 Now, in the spirit of being real, raw, and honest, I’m also publishing a “real home tour” on the blog today, so you can see what my house looks like on a more regular basis, when I don’t have the kids out of the house for a few hours and get to actually decorate. So stay here for the pretty (and lots more pretty from other bloggers at the bottom of this post), or head over here to see the real everyday deal. I actually changed this room up since I had a bunch of blooms from my fave, The Local Bloom, on hand for a tablescape post. One of these is temporary decor, and the other is a bit more permanent with the pumpkins, all from Homesense. In the kitchen, I changed up the open shelves and added a few more Fall-like colours. I also simplified a little bit more and moved the coffee station closer to the sink – because that just makes so MUCH MORE SENSE! How perfect is this rug in front of the sink? I am obsessed with it. My pal from Casa Alma always has the very best vintage rugs, and she was ever so patient with me as I tried to find the perfect one that didn’t compete too much with our brick backsplash…crazy designer problems! JUST KIDDING! Or am I…? Truthfully, not much has changed here because this room is sort of already very Fall-like with the browns everywhere. I did take this opportunity to actually put something on the coffee table for once, though! The colourful books on the shelves stayed because a little colour never hurt anyone, and if I get sick of these, I’ll just turn the books around so they’re more neutral. I’m toying with new photos of the kids for these frames because these photos make it look like they’re watching TV, but I guess that’s an accurate depiction of what they do in here… ha! The breakfast nook in here also hasn’t changed much, though I’m hoping to use this spot for some fun Christmas things in the next few months. Maybe this can be where we put our advent calendar? I didn’t shoot the upstairs of the house because nothing has changed yet. We’re making over the kids’ room next month, and our room never changes much, but you can see it all in the REAL real house tour, complete with kids in Halloween costumes, dirty dishes, and laundry. For more pretty, check out my fellow bloggers’ homes! There’s so much gorgeous inspiration! Big huge thanks to Shannon and Christina for setting this up for us all!! The To Do List – Updated! I’m in love with your statement wall paper in the dining area. What a show stopper. Loving both versions of your home tour, Thalita! :) So true, there’s the cleaned up version and the everyday version. And when your kids are little the everyday version is a bit crazier! So happy to have you on the tour! Oh Thalita, you’ve just got the most gorgeous home! You’re kitchen gets me every time! You’re such a pro at styling those shelves and all that warm wood and those beautiful copper touches makes everything feel so cozy. Your home looks SO lovely Thalita! You have so many perfect fall touches…it’s so cozy and gorgeous! Thalita, your house looks great. I loved all the touches for fall, like the little pumpkins. I especially love your shelves and that new little rug -love it! Fantastic, Thalita! I love your style – the modern but rustic edge is gorgeous. So fun to take your tour!! Wow, so gorgeous, Thalita! Your home is stunning and I love all your fall details. Wow, your home is just stunning, Thalita! I love every fall detail. You have such a beautiful and unique home! Great find on the rug, and your open shelving in the kitchen is just beautiful…. I love your styling. Thanks for opening your home! I think your kitchen is one of my favourites of all time. It hits all the marks for me and you know I love your vintage touches. Gorgeous. Your home is sooooooo beautiful Thalita…your kitchen is to die for!!! And I love the pictures of your kids…they’re so fun! I love it Thalita! No matter the season, I love what you do with your house!